Nasal Surgery or Rhinoplasty (“nose job”) is the precise surgical alteration of the nose to change its overall shape and/or improve or maintain its function. Cosmetic nasal surgery can correct a variety of conditions including an over-sized nose, a hump on the bridge, or an undesirable shape of the nasal tip. Dr. Bublik creates facial harmony among his rhinoplasty patients by surgically altering the nose to balance all the features of the face. He believes in the natural look. Not all nose surgery is performed for strictly cosmetic purposes. Rhinoplasty can correct structural abnormalities, such as a deviated septum, which can lead to breathing problems, chronic stuffiness, post-nasal drip and even snoring. Surgeries performed for functional breathing issues may be reimbursed by most medical insurance companies. However, many of our Los Angeles Rhinoplasty patients elect to add a cosmetic component to achieve the best aesthetic outcome from their functional procedures. Dr. Bublik is trained in two disciplines, making him uniquely qualified for nasal surgery. As a Board Certified Otolaryngologist (Ear, Nose, and Throat) and Fellowship Trained Facial Plastic Surgeon, he has the ability to improve both the appearance of the nose while simultaneously improving breathing function to permit the best possible outcomes from nasal surgery. Dr. Bubliks' goals for each rhinoplasty surgery is to make sure that the result matches closely with the desires of the patient. His goal is to improve the nose functionally and aesthetically, and to create harmony with the other facial features. His rhinoplasty outcomes are always individualized to each patient. He aims to create a well proportioned nose, that enhances the beauty of the eyes, allows for comfortable nasal function, and is in peaceful harmony with the other features of the face. 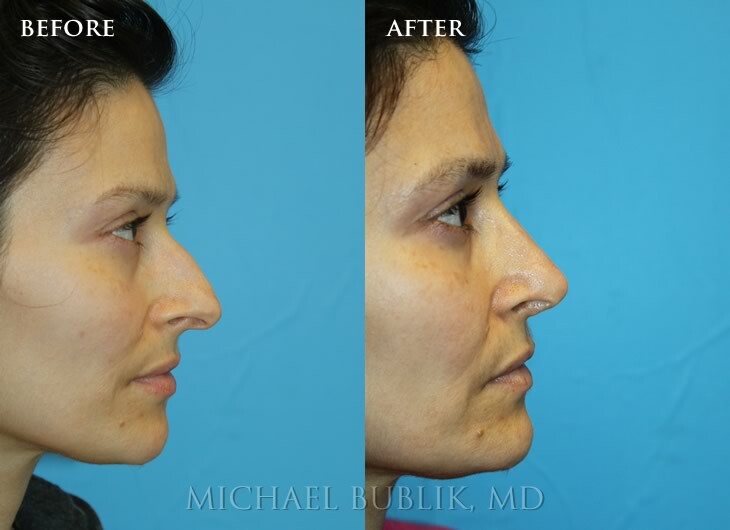 Dr. Bublik is often sought after for not only primary or first-time rhinoplasty, but also revision rhinoplasty. This is due to his extensive training with some of the best rhinoplasty surgeons in the world. He brings with him years of experience as well as the experience of being involved in thousands of rhinoplasty cases. 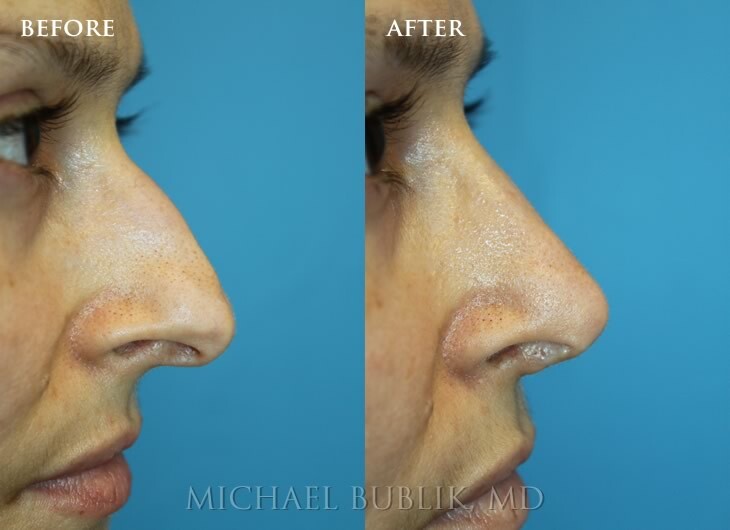 Dr. Bublik’s passion for rhinoplasty surgery stems from his intense training and dedication for this operation. Rhinoplasty is often considered one of the most challenging operations and it is therefore important for patients to seek out surgeons who have dedicated the time and effort to study this operation. 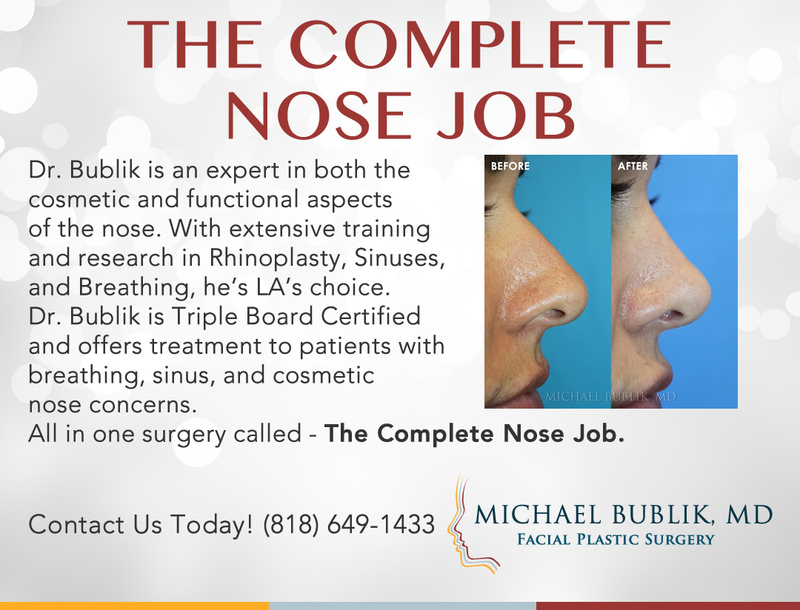 Dr. Bublik’s background in head and neck surgery and facial plastic surgery has taught him to appreciate the functional and cosmetic aspects of nasal surgery and he strives to improve nasal breathing and function while improving the overall cosmetic appearance of the nose. 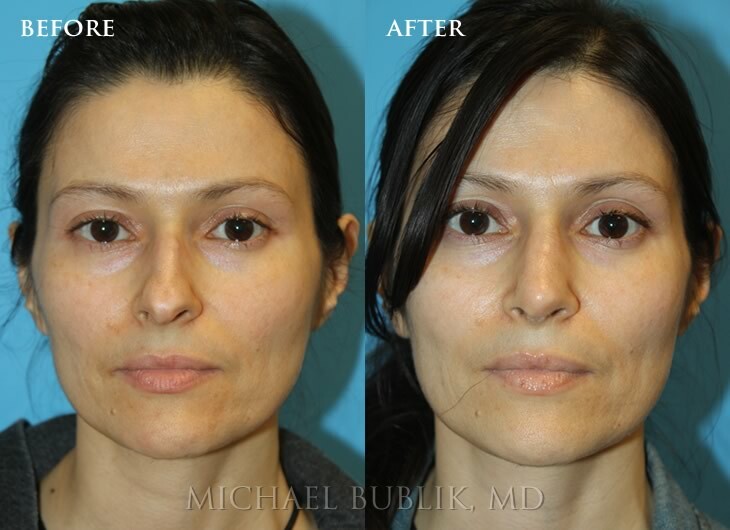 One of the Dr. Bublik’s teachers and world renowned Rhinoplasty surgeons stated that the results of a good rhinoplasty should be seen in the eyes. This is Dr. Bublik’s goal – to have attention directed to the eyes, rather than the nose after the surgery. We feel you will be comfortable and satisfied with your consultation, surgery, and outcome if you decide to choose Dr. Bublik. The septum is the thin wall that separates the right and left side of the nose and gives structure to the nose. The septum can be crooked due to trauma from sports or another form of injury or just from natural growth. If the septum is crooked, one or both sides of the nose may be blocked that making it extremely difficult for patients to breath at rest and during exercise. 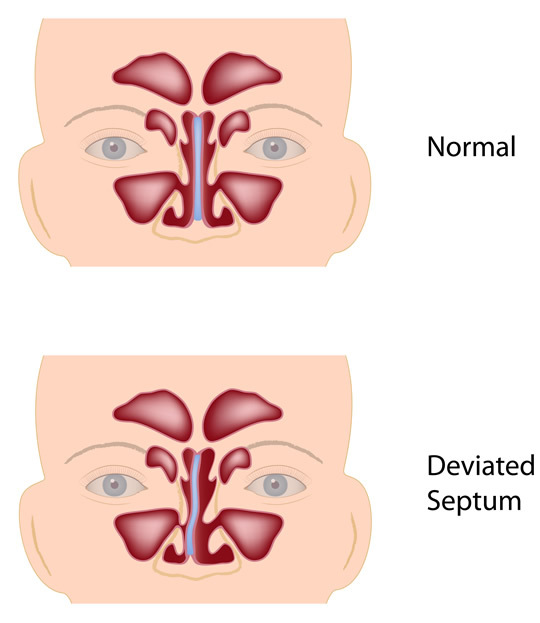 Often patients have sleep apnea because of a deviated septum which can cause significant medical problems. Septoplasty is a surgery where the septum is straightened. Septoplasty is a very short procedure with almost no downtime and almost no pain. Dr. Bublik is an expert in this procedure. The first line of therapy is always medical treatment such as nasal steroid sprays, but often it fails. Dr. Bublik will examine your nose during your consultation often with a small camera and you will be able to visualize the extent of the septal deviation. Dr. Bublik is one of the world leaders in this surgery. Turbinates are composed of soft tissue and bone on the lateral nasal wall that helps humidify the air that first passes through them and then into the lungs. If they are enlarged, they can actually obstruct breathing. Turbinate reduction is a process whereby these mounds are decreased in size. This is a short procedure with no downtime and almost no discomfort. This procedure can even be done in the office with local anesthesia or in the operating room when combined with a septoplasty and often sinus surgery. Once again, Dr. Bublik will perform a nasal endoscopy in the visit for full visualization to determine the exact procedure that needs to be done. The sinuses are small cavities in the above, below and between the eyes. 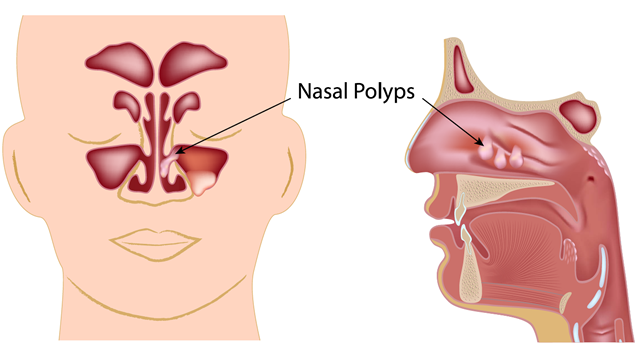 If there is blockage of flow out from either large turbinate, allergies or polyps the sinuses don’t function and cause pressure, headaches and severe difficulty breathing. In addition, many patients will have severe sinusitis and infections requiring antibiotics. Often medical therapy does not work and Dr. Bublik is able to restore your function with a sinus procedure at the same time with minimal downtime and no pain. Dr. Bublik performs this procedure with the latest technology, including balloon sinuplasty, Image CT-guidance, and minimally invasive endoscopic procedures with no external incisions. 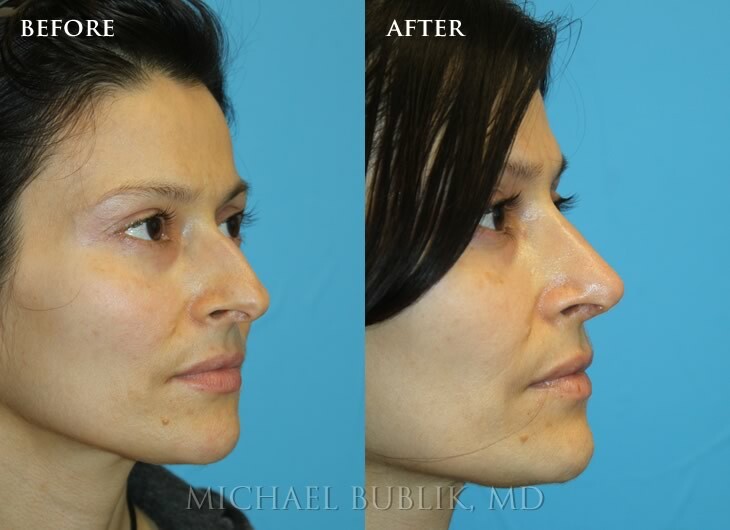 Dr. Bublik is a world renowned expert in sinus and rhinoplasty surgery and patients can have all these procedures done in one minimally invasive procedure with minimal downtime and pain. The patient had a large dorsal bump, contour irregularities and a "bumpy appearing nose." She also had breathing difficulty and sinus issues and underwent external rhinoplasty, septoplasty, and turbinate reduction to help with her cosmetic and functional nasal concerns. She wanted her bump removed to achieve a natural beautiful straight line. Conservative rhinoplasty techniques were used to achieve this result. She had a more natural and "smooth" appearing nasal contour. Our Rhinoplasty practices are conveniently located in Beverly Hills and Glendale CA. We are currently accepting new patients and encourage you to schedule a consultation about your nose and discuss your goals with Dr. Bublik. We will be able to provide an assessment and options based on your unique needs.